"New York City’s Comptroller William Thompson is reportedly mulling investing some of the city’s $100 billion pension fund into U.S. infrastructure funds and hedge funds." Expect other pension fund managers to do the same. Infrastructure will be the next big theme over the coming years. Investment made here will be like getting into commodities in 2002. You'll make a fortune in the right vehicles and companies. If you desire, you can track the foreign currency position of the Fed (and these dollar loans to foreign central banks) on a weekly basis by going to the Fed's "Statement of Condition" website below. Historical releases are also available there. When looking at this balance sheet pay attention to the item marked, "Other Federal Reserve assets." You'll notice that it's up to $522.9 billion. That's up $83 billion from the prior week and up $481 billion year over year. Just so you know, next to the footnote for this entry it says: "Includes assets denominated in foreign currencies and any exchange-translation assets, which are revalued daily at market exchange rates." Fed has accumulated vast foreign currency holdings in a brief time. Bullish for dollar. In the past four months the Fed has lent out $522 billion in U.S. dollar loans to foreign central banks, taking on an equivalent amount of foreign currency. 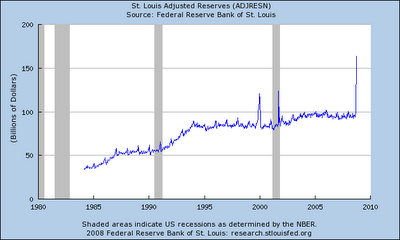 This is an enormous increase in foreign reserves held by the Fed. Back in June the Fed only had $38 billion in foreign currency holdings and that’s about the amount it has held for years and years. This has huge implications. Loans between central banks such as this must be repaid. And they must be repaid to the Fed in dollars. Foreign central banks have doled this money out to banks in their respective nations and who knows what these loans are being used for. Furthermore, it is probably safe to assume that some percentage of these loans will not get paid back. (That even happens in good times.) But CBs will be on the hook to the Fed for the entire amount. Ultimately, the only way for foreign CBs to pay back any shortfall is to sell their own currency and buy the dollar. This could underpin the dollar for some time to come. Moreover, if the U.S. government’s attempts to shore up the financial markets and economy succeed, investors will want to own the dollar. A “perfect storm” of dollar bullish fundamentals may be coming together. I am short such currencies as the Hugarian forint, the Polish Zloty as well as the British Pound, Canadian dollar and most important, the euro. Many hedge funds are imploding due to the current crisis and that's good: they were like children with loaded guns and too dangerous for the markets. However, some of practitioners of one form of speculation--naked short selling--are now arming themselves with more funds, ostensibly to continue doing what they love to do: destroy companies. SAC Capital's Steve Cohen and Greenlight Capital's David Einhorn have been raising a lot of fresh money. Both were instrumental in the demise of Lehman. Until we outlaw this activity you should expect to see other firms targeted. But the Fed wouldn't give a loan to Lehman. Unreal!!! 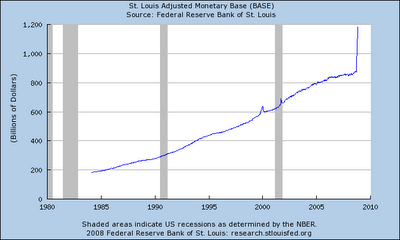 Notice money supply still not growing very rapidly, however, that is going to change very soon. This morning I watched CNBC market commentator, Rick Santelli, talk about the upcoming supply of new Treasuries that are about to be auctioned off. His concern was the size of the supply and what impact it could have on prices and rates, as if to suggest that buying all these new bills, notes and bonds will put a strain on investors’ cash. What Santelli and many others fail to realize is that the Fed has already put more than $2 trillion into the banking system, meaning that the $100 billion or so of new supply will be readily absorbed with little trouble. Moreover, the interest rate on most of these securities is far higher than the interest rate the Fed pays on reserve balances (currently, about 1.15 percent), meaning that there is a good economic incentive to buy them. In essence, this is simply a swap that replaces a low yielding reserve balance for a higher yielding Treasury security. ***Remember: the funds that are used to buy Government securities (and pay taxes) come from Government spending. The money is put into the banking system first, ensuring that there is always an ample amount to buy the securities. It is also why supply does not affect interest rates. Rates are set by the central bank. Take a look at the huge jump in lending reported in the past two weeks. This is more than what had occurred over the prior 9 months! “I am for a stimulus package. I am not for a stimulus package that just sends out checks,” said Kerry at a Boston Herald editorial meeting yesterday. Instead, Kerry said the nation needs to spend more in areas that will both help the economy in the short run and long run - such as on roads and bridges, clean energy initiatives and life sciences. Calling current financial woes the most “complicated economic time we’ve had since the Great Depression,” Kerry said new approaches are needed to reform the current financial system. “We’re operating with old institutions that are incapable of responding fast enough, dealing with vast sums of money that cross boundaries in different financial centers,” said Kerry, who plans to provide more details of his economic agenda Tuesday at North Shore Community College in Lynn. Democrats in Washington are pushing for more New Deal-like spending approaches for helping the economy, while the Republicans support boosting the economy via tax cuts. Yes, rates are collapsing even though the deficit is ballooning to a record. The debt/doomsday crowd just doesn't get it: there is no connection between the deficit and interest rates. Actually, one could even argue that a small deficit or worse, a surplus, actually can cause rates to rise. Indeed, earlier in the day, Martin Neil Baily, an economist for the Brookings Institution, told the same congressional panel that a stimulus package would have to be anywhere between $150 billion to $300 billion to have any significant impact. He said that direct relief to ailing states with revenue shortfalls was necessary. But Pelosi said she wasn't ready to scale the package that large because of concerns of what it would do to the escalating deficit. "One hundred and fifty billion would be closer to what the economy needs," she said. "I don't know if we can afford all that the economy needs." Pelosi has said that she would call the House into a lame-duck session following the elections if there are signs a package can be passed. House Republicans remain opposed to any stimulus legislation. Hopefully they will be gone soon. White House press secretary Dana Perino said the plan would have to be different than the one passed in September to merit the president's support. "What we've seen put forward so far by the leaders in Congress, the Democrats, were elements of a package that we did not think would actually stimulate the economy," Perino said. Oh, you mean like real spending in the economy??? It's textbook. Congress also passed a $168 billion stimulus package in February that put money directly in the hands of millions of taxpayers, but critics said that did little to slow the economy's decline as nervous Americans saved rather than spent the money, or used it to pay down debt. Congress this month passed a $750 billion rescue bill to bolster banks and improve the credit marks. Budget hawks warned Monday that a new stimulus package could send the federal budget deficit soaring toward $1 trillion. And? So?? Would still only be about the size of the Reagan deficit, when looked at as a percentage of GDP. "We're looking at easily a $750 billion deficit next year alone," said Rep. Paul Ryan (R-Wis.). "You throw a stimulus thing on this of 300 [billion], we're over a trillion-dollar budget deficit. Now, the question is … what does that do to the value of our dollar? What does that do to our borrowing costs?" A bloated deficit could lead to inflation, but Kent Hughes, an economist with the Woodrow Wilson International Center for Scholars in Washington, said boosting the flailing economy was more important. "That's the right risk to take," he said. "The right remedy for the trade cycle is not be found in abolishing booms and thus keeping us permanently in a semi-slump; but in abolishing slumps and thus keeping us permanently in a quasi-boom." It can all be stopped with a massive spending package. But myths about deficits and "gold-standard-thinking" keep us from saving ourselves. What a shame. Fed rate cut expected, however, that won't do anything at this point. This is now classic, "pushing on a string." Would be much more effective for the Fed to buy stocks or better yet, stock index futures. Put a floor under this and stop the panic. Five months ago this was an 80 dollar stock. Bought it today at 20.90. What a bargain! Still major global oil player. Good time to get some cheap international diversification to Brazil market. Speaking to the European Parliament on Tuesday, French President Nicolas Sarkozy said that an “economic government” partnering with the European Central Bank (ECB) was necessary for the continuation of the 15-nation eurozone — the collection of nations within the European Union that uses the euro as currency. The suggestion comes as the eurozone and the rest of Europe faces a financial and banking crisis. As a result, deficiencies have been unearthed within the EU economic structure that can only be overcome by greater integration of member states’ financial and economic authorities. Or, eliminating the statute preventing the ECB to be the lender of last resort to institutions within the Eurozone. At the present time it is precluded from doing that by treaty. The financial and banking imbroglio consuming Europe has emphasized how the EU and specifically the eurozone — although impressive and supranational — are nonetheless unprepared for, and incapable of handling, wide-ranging economic crises. The European Union is not a superstate, despite the accusations of its detractors or the wishful thinking of its supporters. It does not have a unified decision-making authority on most policy issues except for those concerning the functioning of its common market, and those are primarily non-political. National governments of member states — across the ideological spectrum — have repeatedly shirked from giving up national sovereignty over vital political, military and economic issues. As the European Union expanded beyond the initial core of Western European states, the idea of policy convergence under a single decision-making authority died — although the Western Europeans themselves never managed to resolve issues of sovereignty either. The European Union essentially became a project of expanding the common market to virgin markets to the east. Until 2008, this endeavor was relatively successful and highly lucrative, opening new markets for European manufacturers and banks. Yes, until 2008. That's when things started to get turbulent. The establishment of the eurozone is an impressive feat in its own right. It binds together 15 economies within the 27-member union with a common currency and a common central bank. However, the ECB and the eurozone in general lack a number of competencies that, if ever implemented, would have impinged on national sovereignty but would have also made monetary and economic sense. These include taxation, currency “printing”, decision-making on where to funnel funds in times of crises and European-wide bank regulation. But the question is, will they EVER allow those things to impinge on national sovereignty? Or will they opt out of the Eurozone instead? In times of plenty — which the eurozone has experienced for the most part since its inception — it may seem sufficient that the authority of the ECB is strictly limited to keeping inflation under 2 percent (a role inherited from its direct ancestor the German Deutsche Bundesbank). However, the current crisis illustrates the deficiency of this system. Without supranational taxation, the eurozone does not have the ability to make liquidity infusions into the system directly — it simply does not have any real cash of its own. In fact, Europeans have had to depend on the U.S. Federal Reserve for capital through unlimited dollar funds made available Oct. 13. A credit-starved Europe had to draw $250 billion — with hundreds of billions more potentially outstanding — on the first day the Fed announced that swaps would be unlimited. Even with a taxation system that would supply the ECB with its own pool of funds, someone would still have to make a political decision regarding receivership of those funds. The eurozone is therefore a monetary union with common monetary policy, but has no political oversight. This policy disjuncture becomes extremely relevant during times of economic crisis. And because the ECB does not have authority over the disparate banking systems, banking remains unregulated at the EU level, creating further problems once a crisis does hit. Taxation not necessary to "provide" those funds. But author clearly doesn't understand this. Sarkozy’s plan to create an “economic government” would in theory address all of the deficiencies listed above. The idea would be to imbue the current monetary union with political direction and authority. However, the idea would also necessitate surrendering national sovereignty to an extent — an action that Europeans have repeatedly proved unwilling to take. Will they now be willing? Still questionable. Sarkozy may have tried to allay these fears by using the word “economic” — highlighting that the authority would not extend beyond the policy realm currently being rocked by the financial crisis. This is a valiant marketing effort for sure, but in reality one cannot separate the political and the economic “government”, especially if the eurozone receives authority over taxation or the ECB becomes responsible for deciding which banks get bailed out or which industries receive loans. Were the Europeans willing to go this far in giving up national sovereignty, they would have done it already. Agreed. That is absolutely the point and why it is not likely to happen. A dissolution of the EU, at least in part, is more likely. Countries that do not have access to Fed loans are seeing their currencies spiral into a freefall. The Hungarian central bank raised its benchmark interest rate by a full 3-percent overnight (now at 11.5 percent) to try to defend the Forint. Although the ECB has access to the Fed and dollar loans, Eurozone banks may still be very short of dollars and this could cause a similar spiraling down of the euro. The ECB may actually be forced to raise interest rates to defend the euro, causing even more damage to the Eurozone economy. This is the endgame for the euro and we could be witnessing its coming apart. Overnight saw more violent selling of foreign currencies and buying of the U.S. dollar. Record lows for the Indian rupee, Mexican peso among others. New 3-year lows for the Canadian dollar. New 5-year lows for the British Pound and similar weakness for many others. The euro is in a freefall that is likely to accelerate. Gold is down and will fall much more as the euro deteriorates. If you want to get on board this monstrous dollar rally, but are leery of opening a Forex account or just feel that you are not sophisticated enough, then try these two ETFs that are designed to profit from a rising dollar and falling euro. Nations of the world and financial institutions are scrambling for dollars. In cases where the Fed is lending dollars directly, like to the ECB and the Eurozone, the dollar rally has been orderly, but relentless. In cases where the Fed is not supplying the dollars, there has been panic selling of the local currency for dollars (S. Korea, India, Mexico). You won't hear that in the media. P.S. Gold set to fall, SHARPLY! Clinton's Treasury Secretary, Robert Rubin, pushed for a surplus and that led to the sharpest decline in the savings rate in the history of our country. One could argue that President Bush's policies have recently helped to stabilize that decline. If we try to balance the budget now the savings rate would plunge negative and stay there causing enormous harm to the economy and household balance sheets. The policies of both presidential candidates suggest this is a frighteningly real possibility. That’s probably because the deficit is irrelevant. This year’s deficit of $436 billion, while the largest in nominal terms, is smaller than the deficit of France, Germany and Japan and it is smaller than the deficit we ran in 2003 when viewed as a percent of GDP. However, the media doesn’t seem to want to put it in perspective. The fact is, the deficit is too small. At $436 billion the deficit now is about 3.3 percent of GDP. Not until you see it reach somewhere around $700 billion can you say it is high enough to turn things around. And when it does hit that, don’t expect the misinformed media and fiscal conservative types to be cheering. But if you want a better economy, get out the pom poms. Rising deficits in the Eurozone can make the member nations "insolvent." The above headline comes from Warren Mosler's blog. And he is absolutely right. There is no "Federal Government of Europe." Budget deficits must be financed with OPM (other people's money). Member states in the Eurozone cannot simply credit bank accounts as the the Federal Government of the United States can. Only the ECB can and it is precluded by treaty from doing so. The risk of a "payments crisis" among Eurozone member states is real. Past payments crises--whether in Argentina, Mexico or elsewhere--have led to currency collapse and, sometimes, blood in the streets. 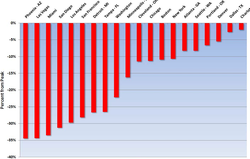 Member states of the Eurozone face potential insolvency if the Fed cuts off their funding. The euro faces potential collapse if European Central Banks cannot repay the loans the Fed has made to them. 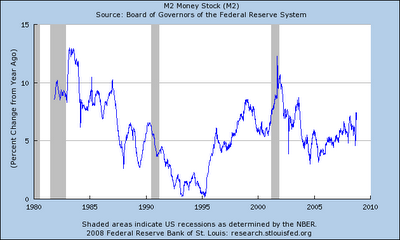 Notice that while monetary base and reserves have shot up, money supply is still hardly growing at all. But this could change soon. The next Secretary of the Treasury is likely to be another Wall Street banker. It is already rumored that JP Morgan CEO, Jamie Dimon, is Obama's favorite pick. But do we need another Wall Street banker at this critical time? True, Dimon navigated JP Morgan through the current subprime mess better than most of his peers, but the real question is, does he have the background in economics and public policy that will be needed to bring forth the major changes and investments needed to save our economy? I doubt it. If appointed he'll likely go about his job the same way many of his predecessors from private enterprise did--preaching fiscal discipline and extending bailouts to large firms deemed "too big to fail." My choice for Treasury Secretary is James K. Galbraith, economist and son of the late, John Kenneth Galbraith, one of America's foremost economists during the last century. Dr. Galbraith understands why the ideology of unregulated free market capitalism ended up bringing us the current disaster. His ideas and policy prescriptions are ideally suited to the challenges we face. He does not subscribe to the myths about deficits. He is not mired in "gold standard" type of thinking. Professor Galbraith is also a member of Barack Obama's economic advisory team (I am assuming an Obama win). Not surprisingly, however, Obama will probably go with the safe, but altogether inappropriate choice of Jamie Dimon when a real diamond is standing right along beside him. (Obama talks a lot about change, but his actions belie his words.) That's unfortunate for us. I personally use Oanda. It is by far the most sophisticated. This is what we need! A stimlus that addresses mounting weakness in the real economy. Imagine if, at the end of the day, Pelosi's plan leads to a real rebound in the market and the economy? What Hank Paulson couldn't do, Pelosi might actually end up doing! "The California Democrat envisions a bill that would include new spending on highways and bridges, extended benefits to unemployed workers, aid to cash-strapped states and a tax cut, congressional aides said. She has asked several House committees to examine details of a possible plan. And as part of the effort, Federal Reserve Chairman Ben Bernanke is expected to testify next week before the House Budget Committee on the state of the economy. Ms. Pelosi is expected to call lawmakers back to Washington in late November to take up the issue." Republicans will almost certainly oppose on the grounds that it would be "fiscally imprudent." --Defended the Fed's decision to let Lehman Brothers fail, saying the company didn't have enough collateral to post for a Fed loan. Yet he "defends" giving unsecured, non-recourse loans to European banks instead??? Unreal!!! "Under these circumstances, deficit spending is not unwelcome. Indeed, as spender of last resort, the government will probably have to run deficits to keep the economy going anywhere near capacity, a lesson the nation learned on a large scale when mobilization for World War II finally lifted us out of the Great Depression." 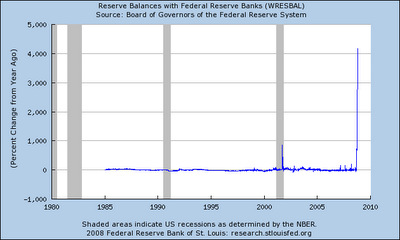 Deficit Shackles: Will January, 2009 Repeat January 1993? Both presidential candidates have been criticized for failing to name any promises or plans they’re going to have to scrap because of the bailout and the failing economy. That criticism is unwarranted. The assumption that we are about to have a rerun of 1993 — when Bill Clinton, newly installed as president, was forced to jettison much of his agenda because of a surging budget deficit — may well be mistaken. At first glance, January 2009 is starting to look a lot like January 1993. Then, the federal deficit was running at roughly $300 billion a year, or about 5 percent of gross domestic product, way too high for comfort. By contrast, the deficit for the 2009 fiscal year is now projected to be $482 billion, or about 3.3 percent of gross domestic product. That’s not too worrying. But if the Treasury shovels out the full $700 billion of bailout money next year, the deficit could balloon to more than 6 percent of gross domestic product, the highest it’s been since 1983. And if the nation plunges into a deeper recession next year, with tax revenues dropping and overall domestic product shrinking, the deficit will be even larger as a proportion of the economy. Yet all is not what it seems. First, the $700 billion bailout is less like an additional government expense than a temporary loan or investment. The Treasury will take on Wall Street’s bad debts — mostly mortgage-backed securities for which there’s no market right now because of the slump in housing prices — and will raise the $700 billion by issuing additional government debt, much of it to global lenders and foreign governments. As America’s housing stock regains value, as we all hope it will, bad debts become better debts, and the Treasury may well be able to resell the securities for at least as much as it paid, if not for a profit. And if there is a shortfall, the bailout bill allows the president to impose a fee on Wall Street to make up the difference. 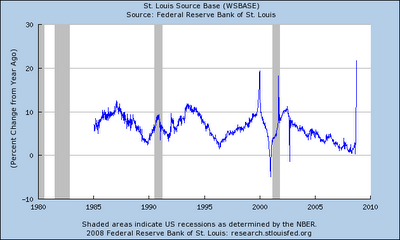 Another difference is that in 1993, the nation was emerging from a recession. Although jobs were slow to return, factory orders were up, companies were expanding, and the economy was growing. This meant growing demand for private capital. Under these circumstances, the deficit Bill Clinton inherited, combined with his own agenda, threatened to overheat the economy, causing inflation. He had no choice but to trim the deficit and abandon many of his plans, a point that the Federal Reserve chairman, Alan Greenspan, was not reluctant to emphasize. Unless President Clinton did so, interest rates would rise and the economic recovery would be anemic. Next year, however, is likely to be quite different. All economic indicators are now pointing toward a deepening recession. Unemployment is already high, and the trend is not encouraging. Factory orders are down. Worried about their jobs and rising costs of fuel, food and health insurance, middle-class Americans are unable or unwilling to spend on much other than necessities. Under these circumstances, deficit spending is not unwelcome. Indeed, as spender of last resort, the government will probably have to run deficits to keep the economy going anywhere near capacity, a lesson the nation learned on a large scale when mobilization for World War II finally lifted us out of the Great Depression. Finally, not all deficits are equal. As every family knows, going into debt in order to send a child to college is fundamentally different from going into debt to take an ocean cruise. Deficits that finance investments in the nation’s future productivity are not the same as deficits that maintain the current standard of living. Here again, there’s marked difference between 1993 and 2009. Then, some of our highways, bridges, ports, levees and public transit systems needed repair. Today, they are crumbling. In 1993, some of our school children were crowded into classrooms too large to learn in, and some districts were shutting preschool and after-school programs. Today, such inadequacies are endemic. In 1993, some 35 million Americans had no health insurance and millions more were barely able to afford the insurance they had. Today, some 50 million are without insurance, and a large swath of the middle class is barely holding on. In 1993, climate change was a problem. Now, it’s an emergency. Moreover, without adequate public investment, the vast majority of Americans will be condemned to a lower standard of living for themselves and their children. The top 1 percent now takes home about 20 percent of total national income. s As recently as 1980, it took home 8 percent. Although the economy has grown considerably since 1980the middle class’s share has shrunk. That’s a problem not just because it strikes so many as being unfair, but also because it’s starting to limit the capacity of most Americans to buy the goods and services the nation produces without going perilously deep into debt. The last time the top 1 percent took home 20 percent of national income, not incidentally, was 1928. Perhaps it should not be surprising, then, that the Wall Street bailout has generated so much anger among middle-class Americans. Let’s not compound the problem by needlessly letting the bailout prevent the government from spending what it must to lift the prospects of Main Street. Here is a perfect example of the difference between Ireland--a member state of the EU that is not a currency issuing nation--and the U.S, which is a currency issuer. Ireland is forced to raise taxes in order to address its deficits, otherwise the government cannot function. Same holds true for other EU member states that use the euro. These countries are functionally like states within the U.S. If they are constrained by lack of funds, they could shut down. Higher rates in Europe will exacerbate the current economic contraction, forcing more bank failures and, ultimately, a true test of the bank desposit "guarantee" and even a test of the euro itself. The euro may be the ultimate casualty in all of this. Very few people are focused on this, yet it could be the biggest trade of all time! DUBLIN, Ireland (AP) -- Ireland is raising income taxes and slashing spending in a budget proposal unveiled Tuesday -- and government officials will lead by example and cut their own paychecks. Finance Minister Brian Lenihan said painful changes were required to cope with an economy facing its first recession since 1983. Often shouting to drown out the heckling of opposition lawmakers, Lenihan told the Parliament his package of tax hikes and spending cuts represented "a call to patriotic action." He said government ministers would lose 10 percent of their salaries. Lenihan forecast that the economy would shrink by more than 1.5 percent this year and by another 1.0 percent next year, while unemployment would rise from its current 10-year high of 6.3 percent to an average of 7.3 percent in 2009. That means tax collections would fall and welfare costs would rise. Lenihan moved up his government's usual budget speech from December to reflect a stunning reversal of Irish fortunes following the Celtic Tiger boom of 1994-2007. He said he would tax people who earn up to 100,000 euros ($137,000) an additional 1 percent; those earning more will pay an additional 2 percent. Meanwhile, national sales tax on most purchases will rise from 21 percent to 21.5 percent. Tax on bank deposits would rise from 20 percent to 23 percent. A new 10 euro ($13.70) tax on most airline tickets for passengers departing Ireland will be imposed in March. He said this measure would raise 95 million euros ($130 million) next year in this aircraft-dependent island nation. Lenihan also immediately raised taxes on gasoline, wine and cigarettes -- by 8 euro cents (11 cents) per liter, 50 euro cents (70 cents) per bottle and 50 euro cents per pack. He said the government plans to shut down 41 state-funded agencies and close army bases, but specified none of those targeted. However, he proposed to cut or keep steady taxes on Ireland's businesses. That reflects Ireland's dependence on more than 1,000 foreign-owned companies -- a foundation of Ireland's 1990s economic rise -- which might be mulling cheaper bases in Eastern Europe or Asia. He said Ireland's 12.5 percent business tax rate "will continue to be a central part of Ireland's economic brand." He said businesses soon will be able to reclaim up to 25 percent of their costs on research and development, up from 20 percent rate. He said that, even if his budget works as projected, Ireland still faces a record 2009 budget deficit of 12 billion euros ($16.5 billion) -- 6.5 percent of its expected gross domestic product. As part of its membership in the 15-nation euro currency, Ireland is supposed to keep deficit spending under 3 percent of GDP. But Ireland has had no red-ink trouble until this year. Lenihan said Ireland's 2009 deficit would have risen above 8 percent of GDP without Tuesday's mix of tax hikes and spending cuts. The figure is up to $354 billion already. That is a huge amount of borrowing in a foreign currency--the USD. History has shown that borrowing in foreign currency leads to disaster. This could be the beginning of the end of the euro, and Eurzone as we know it. These are comments taken from Warren Mosler's website regarding the open ended dollar funding of foreign central banks by our Fed. Functionally, the Fed seems to have agreed to lend USD to the ECB in unlimited quantities unsecured and non-recourse. It’s potentially functionally a fiscal transfer. Interesting they have the authority to do that. They wouldn’t even do it for the US banks where the Fed demands collateral for loans. It opens the door to widespread fraud and corruption as the ECB can now lend USD without supervision or regulation and in any quantity. Somehow this got under Congress’s radar screen. Watch for the size of the first USD auction. The ECB and other CB’s are going to set a rate and fill all requests at that rate. Could be over $1 trillion? 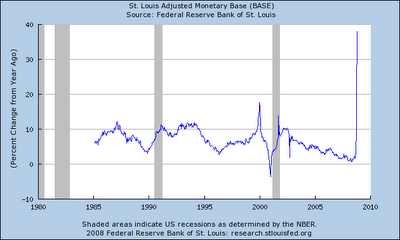 Should bring USD LIBOR down to near the Fed funds rate. Helps the euro vs the USD at first. However, the primary way they pay the Fed back is for someone down the line to sell euros and buy USD. USD debt is external debt for foreign CB’s, so they are in much the same position the emerging market nations used to be in when they were choked with USD debt. Still trying to comprehend all the ramifications, but they are very large. Many bank shares are down or up far less than the broader market. I wonder if they are anticipating tomorrow's announcement of the U.S. plan to recapitalize banks. The plan could include punitive measures to existing shareholders, as we saw with AIG and Fannie/Freddie. On my radio show today I spoke with William Isaac, who was the former chairman of the FDIC. He said that any plan that includes wiping out existing bank shareholders would be "a terrible mistake." Oct. 10 (Bloomberg) -- The global financial crisis is turning into a bigger drain on the U.S. federal budget than experts estimated two weeks ago, ballooning the deficit toward $2 trillion. Bailouts of American International Group, Fannie Mae and Freddie Mac likely will be more expensive than expected. States are turning to Washington for fiscal help. The Federal Reserve said this week it will begin buying commercial paper, the short- term loans companies used to conduct day-to-day business, further increasing costs. And analysts now say the $700 billion bank- rescue plan passed by Congress last week may have to be significantly larger. The 2009 budget deficit could be close to $2 trillion, or 12.5 percent of gross domestic product, more than twice the record of 6 percent set in 1983, according to David Greenlaw, Morgan Stanley's chief economist. Two weeks ago, budget analysts said the measures might push deficit to as much as $1.5 trillion. Yes, and the 6 percent in 1983 presaged strong economic growth, so 12 percent has the potential of being even more stimulative. The deficit during WWII ran up to 40 percent of GDP. Did the U.S. economy collapse? On the contrary, that deficit spending fueled huge growth that carried us for 20 years. Japan's debt is twice as large as the U.S., yet interest rates remain near zero. The government spends the money first (puts it into the economy) and the Treasuries are purchased with the funds the government has already supplied. There is little or no effect on interest rates. Treasuries have fallen the past four days even as stocks sank, a sign investors are preparing for bigger U.S. government borrowing. Benchmark 10-year note yields rose to 3.82 percent at 7:49 a.m. in New York, from a close of 3.45 percent Oct. 6. Payments the government allocated to keep vital companies solvent are beginning to look insufficient. They can always do more and likely will, along with a fiscal package that addresses demand. AIG, the giant insurance company that was taken over by the government in mid-September, said this week it may access $37.8 billion from the Federal Reserve Bank of New York, in addition to the $85 billion the government already loaned it to stave off bankruptcy. ``You're in for a dime, you're in for a dollar on this one,'' said David Havens, a credit analyst at UBS AG. The financial health and earnings prospects of Fannie Mae and Freddie Mac -- seized by the government on Sept. 7 to prevent them from failing -- worsened in the second and third quarters, the companies' government regulator said this week. These entities have effectively been nationalized and therefore are not at risk. In addition, they are being allowed to exist because of a political desire to foster home ownership. This is a public policy issue and so far, there is no sign that the U.S. wants to abandon its drive for universal home ownership. If it did, these entities would be closed or wound down. The companies and regulators are recalculating the value of all of their assets to factor in price erosion. That may mean the government will have to spend more to keep the firms solvent. Again, a public policy choice: supporting home ownership. In our society we deem that as a good thing. The $700 billion is only 5 percent of GDP. We're talking single digit percentage levels of investment. California, Alabama and Massachusetts are urging the Fed and Treasury to include their securities in rescue plans designed for banks and businesses. The $2.66 trillion U.S. market for state and city bonds has been all but frozen since Lehman Brothers Holdings Inc., weighed down by losses in mortgage-backed bonds, declared history's largest bankruptcy on Sept. 15. Yes, we're lucky. We have a Federal Gov't to back our states. Europe doesn't. Individual countries there potentially face an Argentina-like situation under the current structure. California has said it needs to sell as much as $7 billion in notes to maintain its schools, health system and other public services. The Bush administration said it is reviewing the states' financial positions. Meanwhile, Treasury Secretary Henry Paulson indicated two days ago that he is considering buying stakes in a wide range of banks in coming weeks to help recapitalize them. an equity stake. Stupidity in the extreme!!! Such a move is allowed under the $700 billion bailout package Congress passed last week. Edmund Phelps, winner of the 2006 Nobel Prize for economics and a professor at Columbia University, said such action is necessary -- and will likely turn out to increase the measure's cost. Spending beyond the amount set in last week's bill would require further Congressional approval. bailing out Wall Street fat cats. The additional borrowing could push the national debt well past 70 percent of GDP, the highest since the immediate aftermath of World War II, when the U.S. was still paying off war debt. That would still be far less than Japan's 200 percent of GDP. Is Japan a Third World nation? Hardly. Gross U.S. debt, which includes debt held by the public and by government agencies, this year reached about $9.6 trillion, or about 68 percent of gross domestic product. The rescue legislation increased the government's debt limit to more than $11.3 trillion from $10.6 trillion. The debt limit is a politically imposed constraint not an operational constraint. Only petulant idiots like Newt Gingrich and his band would shut down the government and expose us to real default because of such a meaningless thing. On top of all that, budget watchdogs say the sheer size of the interventions is making Washington more profligate than usual. To attract votes in Congress, leaders added several costly items to the $700 billion rescue, including extensions of some tax credits and tax breaks for makers of wooden arrows and stock- car racetrack owners. Under normal circumstances, there would have been more resistance to such expenses, said Robert Bixby, executive director of the Concord Coalition, a non-partisan budget watchdog. The article below explains why we are powerless to save ourselves. My comments are in italics. One of the riskiest financial moves you make this year could be listening to the presidential candidates--and banking on a tax cut after the November elections. John McCain and Barack Obama both promise that widespread tax cuts will be one major way they'll revive the economy and help lift consumers' sagging spirits. They differ, of course, on who should enjoy the largesse. McCain wants to cut estate and corporate income taxes, and extend broad-based tax cuts that were enacted earlier this decade. Obama agrees about extending some of those Bush era tax cuts, while offering lots of other relief to people earning less than $250,000 and raising taxes on the wealthy. But here's what you're not likely to hear either candidate say before Election Day on November 4: There's no money left for tax cuts. And a slumping economy--now almost certainly in recession--will make it hard to pass tax cuts for the next couple of years, and maybe longer. "There's no money left for tax cuts." That is an absolutely absurd statement. Where did the $700 billion suddenly come from for the bailout plan? Where did the money to fight WWII come from? Did we save up after WWI thinking that we'd better sock away some money for another World War??? This is gold standard thinking--the idea that the government is somehow constrained. Thinking like this, in all its forms, about debt, deficits, debt limits, etc widespread and the reason why we can't save ourselves. One obvious reason is the huge, unexpected bill for bailing out banks and other firms saddled with bad debts. All told, the government has committed more than $1 trillion in public funds to help the financial sector get back on its feet. That's more than one third of the government's entire budget in a given year. The feds (and the taxpayers) might get some of the money back--but nobody will know for years. The Fed has alread lent out more than $2 trillion. Where did that money come from?? It's just credits to the banking system. Accounting entries. That's all. Meanwhile, the Congressional Budget Office recently took a much gloomier view of the future, casting a cloud over both candidates' tax-cut plans. For most of the year, CBO had been projecting that government revenues would be more or less in line with spending over the next 10 years. But with the economy spiraling into recession, CBO now projects that the government will spend $2.3 trillion more than it brings in over the next decade. And that's before accounting for any bailout costs. Yes and that deficit will be the "shock absorber" that, hopefully, sustains some level of demand and keeps us out of depression. Such huge deficits will make it hard for Congress to justify any additional funding for tax cuts. "The next president is going to be strongly tied by what's happened over the last year," says Tom Cooley, dean of New York University's Stern School of Business. "It's dubious that any of these tax-cut plans will get through." It's a political constraint, not an operational constraint. We impose these silly limits on ourselves. If McCain gets elected. The estimated cost of McCain's tax cuts over five years is $1.48 trillion, according to the nonpartisan Tax Policy Center. The most costly part of McCain's plan would be the permanent extension of the Bush tax cuts from 2001 and 2003, which lowered taxes for most Americans. Those extensions would amount to $585 billion of lost government revenue, compared to letting tax rates go back to their earlier levels. And if there's any good news for taxpayers, it's that most of the Bush tax cuts are likely to stay in place, regardless of who wins in November. "Resetting them would amount to raising taxes when the economy is not doing so well," says Roberton Williams of the Tax Policy Center. "That harkens back to Herbert Hoover and the Great Depression." If the Bush cuts do become permanent, most workers won't notice--their paychecks will stay the same. The phrase, "lost government revenue" is ridiculous. The government spends in its own money. The money to pay taxes and purchase securities comes from government spending, not the other way around. Think of "lost government revenue" as revenue retained or gained by the non-governmental sector, which means, us!! McCain's other ideas--like lowering the estate tax and making other changes in the tax code that would favor higher earners--would probably meet a tough audience in Congress. By most projections, both houses of Congress will remain in Democratic hands, and there won't be much of a welcome mat for a Republican president hoping to lower taxes on the wealthy. If Obama gets elected. The estimated cost of Obama's tax cuts over five years is $967 billion, according to the Tax Policy Center. Obama also favors the extension of many of the Bush tax cuts, though he'd repeal some that benefit higher earners. In addition, Obama frequently says that under his plan, many people who earn less than $250,000 will pay lower taxes through a variety of credits that target groups like working parents with kids and seniors who make less than $50,000. The problem with Obama's plan is that once it gets to Congress, choosing from a long list of targeted tax credits would fuel bitter fights over who deserves help and who doesn't. Even with Democrats in charge on Capitol Hill, there are fiscal conservatives in both parties sure to oppose the passage of Obama's expensive tax cuts in full. And some of his ideas--like rebates for people who don't even earn enough to pay taxes--are controversial even among Democrats. Obama has already termed his plan, "a net spending cut." That equates to a reduction in aggregate demand for the economy at a time when we are facing an economic depression! With the economy rapidly deteriorating in the last months of the campaign, some analysts foresee the next president holding a 21st century fireside chat to explain the dire reality to his fellow Americans. "He could say, 'The economic situation is a lot worse than I expected, and we're going to have to put this off,' " predicts Williams of the Tax Policy Center. "Nobody's going to say that in the campaign, but I think that will be the first speech either one of them gives in office." That would still leave time for the next president to cut taxes later in his first term--allowing him to save face and still say he fulfilled his tax-cut promises. "Putting things off" is not what President Roosevelt said in his fireside chats. He ramped up government spending and that got us out of the Depression. No matter who gets elected, a second stimulus plan is starting to look more plausible than a quick round of permanent tax cuts. Democratic House Speaker Nancy Pelosi has already called for a second set of rebate checks to be sent to consumers, matching the $150 billion worth of checks sent out earlier this year. That won't happen before the election, because Congress isn't in session, but it could happen right afterward, even before the next president takes the oath in January. Pelosi's plan coincides with a smaller stimulus plan that Obama is calling for, and McCain, like Obama, favored the first stimulus plan. So, it's plausible that instead of tax cuts, many Americans could find another $600 or $1,200 check in their mailboxes sometime next spring. Oh great, more I-Phone sales with rebate checks! When will we learn? We need investment in the wealth producing capital stock of this nation. An infrastructure program, investment in alternative energy. Health care investment. Much higher levels of education investment. These are what's needed now. If there are no meaningful tax cuts, then the wealthy could be the unintended beneficiaries of Washington's red ink, at least for a while. If there are no middle-class tax cuts, then there's no need to raise taxes on the wealthy in order to pay for them, as Obama's plan calls for. Obama, if elected, could still burnish his populist credentials by calling for some sort of tax hike on corporations or the top 1 percent of earners. But odds are he'd get shouted down. In the midst of a scary recession, many economists have already been pointing out the devastating effects of Herbert Hoover's 1932 tax increases, widely blamed for deepening the Depression. By next January, the economy will be scary enough. No president will want to risk making it worse. Bottom line: we can fix all of this, but stupid thinking will keep us from doing so. This will be separate from the $700 billion bailout plan. The "currency of last resort?" Hardly. Gold underperformed the U.S. dollar. By the way, gold stocks were among the week's worst performers--far worse than the Dow. A fiscal plan combined with monetary policy. Something we should do here. "The response must be about more than battering down the hatches ... We should see this as an opportunity to position the economy for the longer term, as well as manage the risks." The report suggested provisional tax payments be deferred for 24 months, capital investment be "prioritised and incentivised"
Monetary base, bank reserves explode!! This has to help alleviate the credit crisis. Bring back the short sellers! "The market is definitely trading on rumors, not news..."
"You can short Morgan Stanley today," said one trader, speaking on condition of anonymity." That about sums it up. By caving in to the hedge funds and "free-marketeers" we will see the needless demise of another firm. The systemic collapse will accelerate with lightning speed if Morgan Stanley goes under. Next up: Goldman Sachs. Keep your eye on Warren Buffet's Berkshire Hathaway stock. That man is about to drop big-time in the wealth rankings. I never thought I'd hear myself say this, but I DO feel sorry for Warren. He's going to lose a lot (along with lots of his investors--that includes pensions funds, etc.) because we've let the barbarians take over. 3) Treasury should immediately rescind its comment about "taking ownership stakes in banks." This is highly irresponsible in that it threatens the holdings of existing shareholders. Moreover, the government already has an "ownership" stake in all corporations via the 35% corporate tax rate. That's enough of a "payback" to taxpayers. In cases where the Treasury deems it necessary to provide capital, they must do that without it being punitive to existing shareholders. 6) Open-ended ban short selling. 7) Ban pension funds and other institutional investors from buying crude oil, gasoline, corn and other important commodities. Impose strict position limits on all speculative futures trading activity. These above actions would function to restore global financial sector liquidity, bolster confidence on the part of risk taking equity investors, boost aggregate demand and long-term productive capital stock, and limit speculative excess that has been driving oil and food prices higher. If you agree with the above please send a copy of this to your Congressional representatives. "Almost half the members of cartel have in the past few days called on the group to act to halt the slide before their next official meeting scheduled to take place in Algeria in late December." With no energy policy in place oil prices will go right back up once the global economy gets back on track. Until then, OPEC will put a floor under prices at current levels. What is happening in the Eurozone exposes the inherent flaws in that system and why the euro will never supplant the dollar as the world's main reserve currency. Without an overriding Federal Government or similar authority, that is unconstrained in its ability to lend to the system in the time of crisis, the euro is simply a "fair weather" currency and nothing more. After this crisis is over, the dollar will not only regain its status but become even more widely used as the currency of exchange, I predict. Only if the EU political structure changes, and the ECB is granted the authority to be a true, lender of last resort, will the euro have a chance of rivaling the dollar. And outside of the euro, no other currency even has a chance. This article was written by Ben Stein and appeared on the Yahoo Finance site today. My comments are in italics. 1) Have a fiscal policy that creates immense deficits in good times and bad, burdening America's posterity with staggering burdens of repaying the debt. America's deficit is small relative to GDP, which is the measure that counts. Even at this year's projected shortfall of $430 billion, it is less as a percent of GDP than during Reagan's years and even smaller than much of the Clinton Presidency. Moreover, our national debt is smaller than Germany, France, Canada, Italy and Japan's. Ben totally distorts the picture on this one. 2) Eliminate regulation of Wall Street and/or fail to enforce the regulations that already exist, instead trusting Wall Street and other money managers and speculators to manage other people's money with few or no regulations and little oversight. 3) Have an energy policy that disallows producing our own energy and instead requires that we buy energy from abroad, thus making our oil prices highly volatile and creating large balance of payments deficits, lowering the value of the dollar and thus making the problem get progressively worse. America holds 3-percent of the world's oil reserves. Drilling will not get us out of this problem. It is naive to think so. Furthermore, OPEC has a 30 year history that shows each time non-OPEC nations have increased output, the Cartel has cut back, offsetting what the non-OPEC producers add, to a large degree. If we get those 2 million barrels per day in the next few years, it would be quite easy for OPEC to reduce their output by that much, keeping global oil prices exactly where they are. Bottom line: we'd still be paying the same. 4) Have Congress mandate that banks and other financial entities lend money to persons they know in advance to have poor credit ratings or none at all. Ben, you're entitled to your own opinion, but not your own facts. 5) Allow investment banks, insurers, and banks to bet their entire net worth and then some on the premise that borrowers known to be improvident will in fact repay those loans. Again, ratings agencies told them that these bets were low risk. 6) Allow the creation of large betting pools called "hedge funds" that can move markets and control the outcome of trading, thus taking a forum for savings and retirement for families and making it into a rigged casino game that exists primarily to fleece suckers like ordinary working men and women. Yes! Especially in their impact on oil and gasoline prices and other commodities. And in the bear raids they conducted on solvent institutions, forcing them to go out of business. Shut this down, I agree with you, Ben!! 7) Have laws that protect corporate officers from being sued for misconduct but at the same time punish lawyers in the private sector who ferret out such misconduct and try to make accountable the people responsible for shareholder and investor losses. If one of those lawyers gets particularly aggressive in protecting stockholders, put him in prison. Sounds like Ben is on some "conspiracy" bent here. 8) Appoint as head of the United States Treasury Department a man whose whole life was spent on Wall Street, who became fantastically rich through his peddling of junk bonds at his firm while the firm later sold short those same sorts of bonds. Or whose firm was instrumental in pushing up crude, heating oil and gasoline prices, and who said that "speculation is not causing gas prices to go up." 9) Scare Americans into putting up $750 billion of their hard earned money to bail out the billionaires and their friends who created the market for loans to poor credit risks (The "subprime" market) and the unbelievably large side bets on those loans, promising that such a bailout would save the retirement savings of Americans, then allow the immense hedge funds to make the market crater immediately afterwards. "Putting up?" Americans have not "put up" one dime. The government will finance the by selling Treasuries to investors around the world who will voluntarily agree to exchange some of their cash for a safe, secure, investment that pays interest. There has been no, "putting up." Could those proceeds have been used more effectively than buying questionable assets? You bet. A giant infrastructure project, investment in education, R&D, alternative energy, the electric grid, extension of unemployment benefits, loans to real businesses, etc. All of these would have created jobs immediately and stopped the decline in the real economy. 10) Propose to save the situation by surtaxing the oil industry, which is owned by our fellow Americans, mostly in their retirement plans, thus penalizing Americans for investing in companies that efficiently and legally produce an indispensable product. This tax is probably a bad idea, unless the proceeds are reinvested in alternative energy. Oil has got to go. 11) Insist that the free market requires that banks and insurers with friends of the Secretary of the Treasury be saved but allow other entities not so fortunate to fail, thus creating total uncertainty and terror among financial institutions, and demolishing all of the confidence built up in financial circles since the days of FDR. Lehman was not saved; Bear Stearns was not saved. But you're right to an extent, the financial sector is probably more trouble than it's worth. Save the real economoy, not financial intermediaries. 12) Then have the Republican candidate say he would keep on the job the Treasury Secretary who facilitated the crisis, failed to protect the nation from the crisis, got the taxpayers to pony up to save his Wall Street buddies, and have the Democratic candidate, as noted, say he would save the day by taxing the stockholders of energy companies. It's a stretch, Ben, to say Paulson facilitated this. And, again, nobody is "ponying up." "The Fed will hold a meeting with 'a small number of banks and buy-side firms' to discuss progress being made on creating a central counterparty, said a New York Fed spokesman who declined to be identified." Hopefully, this will reduce risk and increase transparency. The framework for a whole new new institutional and regulatory model is being put in place, bit by bit. Fed opens the monetary spigot!!! For the first time throughout this entire crisis we see the Fed throwing caution to the wind and applying the awesome monetary power that it has. 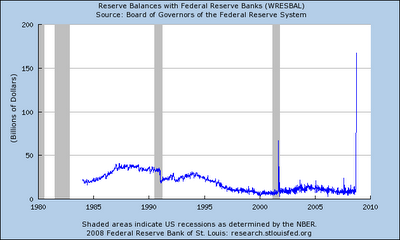 Look at this unbelievable explosion in bank reserves that recently occurred. This is the beginning of the end of this crisis. Help is on the way!!! 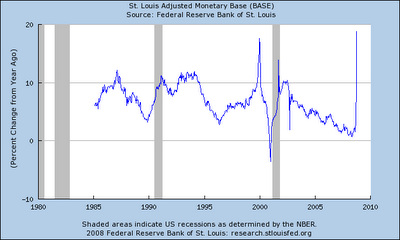 Monetary base is surging. Finally, after more than a year of liquidity injections that the Fed "sterilized" (put in the liquidity but removed it via open market operations), which lead to practically no growth in the monetary base and money aggregates, we see the monetary base explosing higher. Data shows this money measure growing at the fastest pace in 7 years. This is what we needed to see. The Fed has the authority to lend to anyone under Section 13, Paragraph 3 of the Federal Reserve Act. And it may have to start lending directly to states and corporations now as the crisis spreads. "In unusual and exigent circumstances, the Board of Governors of the Federal Reserve System, by the affirmative vote of not less than five members, may authorize any Federal reserve bank, during such periods as the said board may determine, at rates established in accordance with the provisions of section 14, subdivision (d), of this Act, to discount for any individual, partnership, or corporation, notes, drafts, and bills of exchange when such notes, drafts, and bills of exchange are indorsed or otherwise secured to the satisfaction of the Federal Reserve bank: Provided, That before discounting any such note, draft, or bill of exchange for an individual, partnership, or corporation the Federal reserve bank shall obtain evidence that such individual, partnership, or corporation is unable to secure adequate credit accommodations from other banking institutions. All such discounts for individuals, partnerships, or corporations shall be subject to such limitations, restrictions, and regulations as the Board of Governors of the Federal Reserve System may prescribe." Deeply disturbing: Wachovia failed because the Fed didn't act! Wachovia wasn't insolvent. Regulators said that it's failure was "not the result of a capital problem." Then why did they let the bank fail? The FDIC said it failed due to a "liquidity problem. "They let it fail because depositors were withdrawing their money in droves and the Fed stood by and did NOTHING! All shareholders of Wachovia should be outraged at this!! The Fed was created to prevent exactly what happened to Wachovia, yet they did nothing. Worse, they forced the bank into the hands of a competitor for no reason. This is outrageous. Many people want to blame the CRA for this crisis. Here is a great post by Barry Ritholtz that appeared on his blog. I think it treats this subject quite well. or payment history of mortgage applicants? supervision or examinations. How was this caused by either CRA or GSEs ? • What about "No Money Down" Mortgages (0% down payments) ? Were they required by the CRA? Fannie? Freddie? • Explain the shift in Loan to value from 80% to 120%: What was it in the Act that changed this traditional lending requirement? appraisers again and again? How did they manage to always come in at exactly the purchase price, no matter what? • Did the CRA require banks to develop automated underwriting (AU) systems that emphasized speed rather than accuracy in order to process the greatest number of mortgage apps as quickly as possible? • How exactly did legislation force Moody's, S&Ps and Fitch to rate junk paper as Triple AAA? • What about piggy back loans? Were banks required by Congress to lend the first mortgage and do a HELOC for the down payment -- at the same time? • The four biggest problem areas for housing (by price decreases) are: Phoenix, Arizona; Las Vegas, Nevada; Miami, Florida, and San Diego, California. Explain exactly how these affluent, non-minority regions were impacted by the Community Reinvesment Act ? • Did the GSEs require banks to not check credit scores? Assets? Income? • What was it in the Act that forced banks to make "interest only" loans? Were "Neg Am loans" also part of the legislative requirements also? • Consider this February 2003 speech by Countrywide CEO Angelo Mozlilo at the American Bankers National Real Estate Conference. He advocated zero down payment mortgages -- was that a CRA requirement too, or just a grab for more market share, and bad banking? The answer to all of the above questions is no, none, and nothing at all. there is plenty of things to be angry at D.C. about -- but this ain't one of them. Dr. James K. Galbraith explains why this is not putting "taxpayers on the hook," as has been widely reported. "Many are concerned with the fiscal implications of this bill, so let me turn to that question. Despite the common use of language, the capital cost of this bill does not involve 'taxpayer dollars.' It authorizes a financial transaction, exchanging good debt (U.S. Treasury bills and bonds) for bad debt (the "troubled assets"). Many of those troubled assets will continue to earn income for some time, perhaps a long time. The U.S. Treasury commits itself to paying the interest on the debts it issues. The net fiscal cost -- which is also the net fiscal stimulus -- of this bill is the difference between those two revenue streams. Given the very low rate of interest presently prevailing on Treasury bills, this is likely to be somewhere between $20 billion per year and zero from the beginning, even if the Treasury were to issue all $700 billion in new debt at once. It is a mistake, in short, to count the capital cost as a "cost to the taxpayer." Listen to my daily radio show! "Taxpayers on the hook." That's all you hear from our policy makers and the people. It's not true. Read Steve Conover's easy to understand explanation of why this is not costing taxpayers a dime. In the New York Times today there is an article about how the U.S. financial crisis is spreading to Europe. Mostly, it blames the U.S. and assumes similar steps will be taken in Euroland to stave off a banking collapse. But the media and the analysts fail to understand that there is a huge distinction between the U.S. and member nations of the Eurozone, which is, that the U.S. is a currency issuing nation and can come up with the $700 billion or whatever amount to arrest a banking panic. European nations cannot. Only the European Central Bank can do that and it is precluded by treaty from coming to the rescue. "In the last two days, governments from London to Berlin have seized or bailed out five faltering banks. In Ireland, where rumors of panicked withdrawals from banks spooked the stock market, the government has offered a two-year blanket guarantee on all deposits and bank debt." "The Irish plan guarantees bank deposits and debt for customers and creditors of six banks. That makes the government responsible for $400 billion, twice the country’s economic output." "Where will it come up with the money? It is not a currency issuer." "Ireland’s finance minister, Brian Lenihan, traced his country’s predicament back to Lehman Brothers, saying that the American authorities 'were mistaken in permitting that bank to go to the wall because it has had very serious consequences for the world financial system.'" "He's right. That was a dumb move on Paulson's part. He caved to political pressure and in so doing set of a systemic crisis."